Gannets are large black and white seabirds, with long pointed wings and long bills. 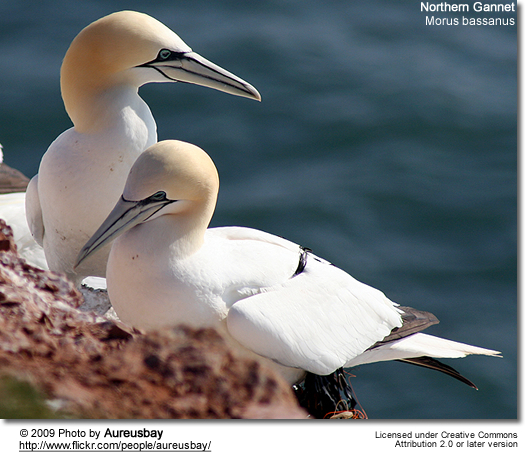 Northern gannets are the largest seabirds in the North Atlantic, with a wingspan of up to 2 metres. The other two species occur in the temperate seas around southern Africa and southern Australia and New Zealand. 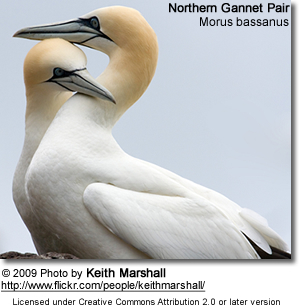 The gannet's supposed capacity for eating large quantities of fish has led to "gannet" becoming a disapproving description of somebody who eats excessively, similar to "glutton.". 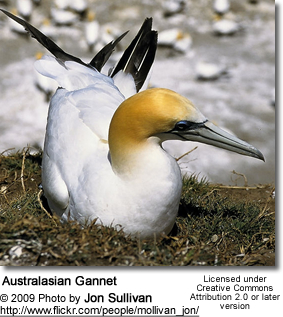 Gannets are colonial breeders on islands and coasts, which normally lay one chalky blue egg. It takes five years for gannets to reach maturity. First-year birds are completely black, and subsequent sub-adult plumages show increasing amounts of white. The most important nesting ground for Northern gannets is the United Kingdom with about two thirds of the world's population. These live mainly in Scotland and the Shetland Isles. The rest of the world's population is divided between Canada, Ireland, Faroe Islands and Iceland, with small numbers in France (they are often seen in the Bay of Biscay), the Channel Islands and Norway. The biggest Northern gannet colony is in the Scottish islands of St Kilda; this colony alone comprises 20% of the entire world's population. Bass Rock in the Firth of Forth is also famous for its large gannet population. 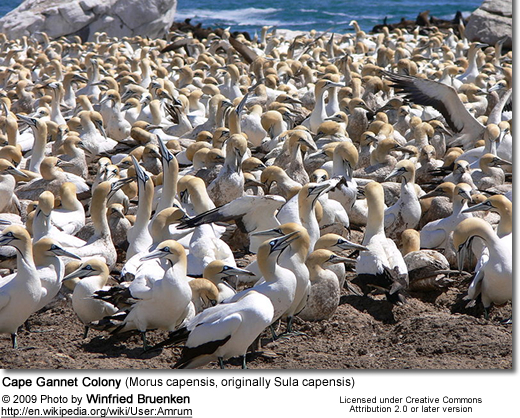 The three gannet species are now usually placed in the genus Morus, Abbott's Booby in Papasula, and the remaining boobies in Sula, but some authorities believe that all nine sulid species should be considered congeneric, in Sula. At one time, the gannets were considered to be a single species. Most fossil gannets are from the Late Miocene or Pliocene, a time when the diversity of seabirds in general was much higher than today. It is not completely clear what caused the decline in species at the end of the Pleistocene; increased competition due to the spread of marine mammals and/or supernova activity which led to mass extinctions of marine life are usually assumed to have played a role. The genus Morus is much better documented in the fossil record than Sula, though the latter is more numerous today. The reasons are not clear; it might be that boobies were better-adapted or simply "lucky" to occur in the right places for dealing with the challenges of the Late Pliocene ecological change, or it could be that many more fossil boobies still await discovery. Notably, gannets are today restricted to temperate oceans while boobies are also found in tropical waters, whereas several of the prehistoric gannet species had a more equatorial distribution than their congeners of today.